It is already common knowledge that individual investors do not usually have the necessary resources and abilities to properly research an investment opportunity. As a result, most investors pick their illusory “winners” by making a superficial analysis and research that leads to poor performance on aggregate. Since stock returns aren’t usually symmetrically distributed and index returns are more affected by a few outlier stocks (i.e. the FAANG stocks dominating and driving S&P 500 Index’s returns in recent years), more than 50% of the constituents of the Standard and Poor’s 500 Index underperform the benchmark. Hence, if you randomly pick a stock, there is more than 50% chance that you’d fail to beat the market. At the same time, the 15 most favored S&P 500 stocks by the hedge funds monitored by Insider Monkey generated a return of 19.7% during the first 2.5 months of 2019 (vs. 13.1% gain for SPY), with 93% of these stocks outperforming the benchmark. Of course, hedge funds do make wrong bets on some occasions and these get disproportionately publicized on financial media, but piggybacking their moves can beat the broader market on average. That’s why we are going to go over recent hedge fund activity in Take-Two Interactive Software, Inc. (NASDAQ:TTWO). Take-Two Interactive Software, Inc. (NASDAQ:TTWO) shares haven’t seen a lot of action during the third quarter. Overall, hedge fund sentiment was unchanged. The stock was in 58 hedge funds’ portfolios at the end of the fourth quarter of 2018. At the end of this article we will also compare TTWO to other stocks including Telecom Italia S.p.A. (NYSE:TI), DISH Network Corp. (NASDAQ:DISH), and Keysight Technologies Inc (NYSE:KEYS) to get a better sense of its popularity. We’re going to take a look at the new hedge fund action encompassing Take-Two Interactive Software, Inc. (NASDAQ:TTWO). 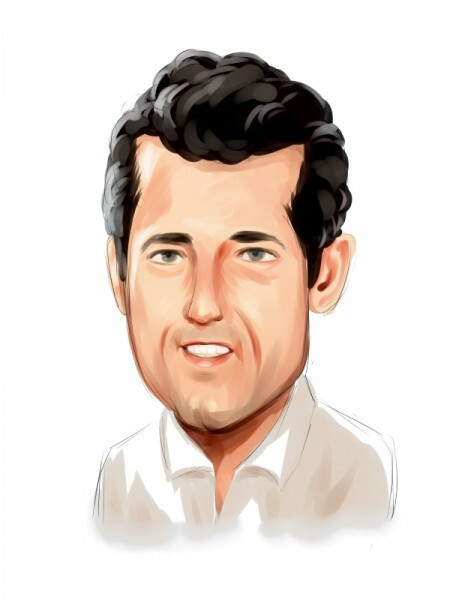 What does the smart money think about Take-Two Interactive Software, Inc. (NASDAQ:TTWO)? Heading into the first quarter of 2019, a total of 58 of the hedge funds tracked by Insider Monkey were long this stock, a change of 0% from one quarter earlier. 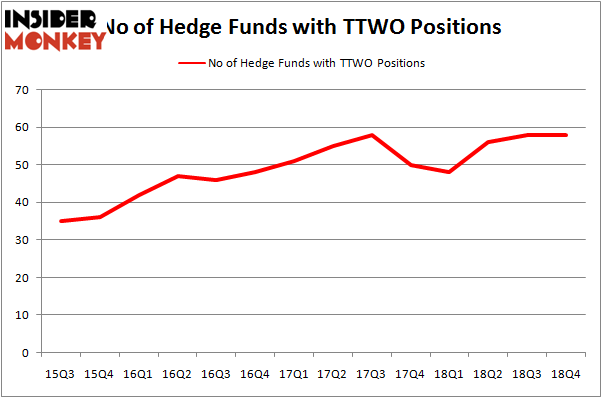 Below, you can check out the change in hedge fund sentiment towards TTWO over the last 14 quarters. So, let’s see which hedge funds were among the top holders of the stock and which hedge funds were making big moves. The largest stake in Take-Two Interactive Software, Inc. (NASDAQ:TTWO) was held by Citadel Investment Group, which reported holding $390.1 million worth of stock at the end of September. It was followed by Eminence Capital with a $116.5 million position. Other investors bullish on the company included Impala Asset Management, Point72 Asset Management, and Newbrook Capital Advisors. Because Take-Two Interactive Software, Inc. (NASDAQ:TTWO) has faced declining sentiment from the aggregate hedge fund industry, we can see that there lies a certain “tier” of hedgies that elected to cut their entire stakes by the end of the third quarter. Interestingly, Josh Resnick’s Jericho Capital Asset Management dropped the largest stake of the “upper crust” of funds monitored by Insider Monkey, comprising about $136.2 million in stock. Edmond M. Safra’s fund, EMS Capital, also said goodbye to its stock, about $83.2 million worth. These bearish behaviors are interesting, as total hedge fund interest stayed the same (this is a bearish signal in our experience). Let’s go over hedge fund activity in other stocks similar to Take-Two Interactive Software, Inc. (NASDAQ:TTWO). These stocks are Telecom Italia S.p.A. (NYSE:TI), DISH Network Corp. (NASDAQ:DISH), Keysight Technologies Inc (NYSE:KEYS), and Gartner Inc (NYSE:IT). This group of stocks’ market caps are closest to TTWO’s market cap. As you can see these stocks had an average of 23.75 hedge funds with bullish positions and the average amount invested in these stocks was $759 million. That figure was $1704 million in TTWO’s case. DISH Network Corp. (NASDAQ:DISH) is the most popular stock in this table. On the other hand Telecom Italia S.p.A. (NYSE:TI) is the least popular one with only 3 bullish hedge fund positions. Compared to these stocks Take-Two Interactive Software, Inc. (NASDAQ:TTWO) is more popular among hedge funds. Considering that hedge funds are fond of this stock in relation to its market cap peers, it may be a good idea to analyze it in detail and potentially include it in your portfolio. Our calculations showed that top 15 most popular stocks among hedge funds returned 19.7% through March 15th and outperformed the S&P 500 ETF (SPY) by 6.6 percentage points. Unfortunately TTWO wasn’t in this group. Hedge funds that bet on TTWO were disappointed as the stock returned 9.1% and underperformed the market. If you are interested in investing in large cap stocks, you should check out the top 15 hedge fund stocks as 13 of these outperformed the market. Here’s What Hedge Funds Think About D.R. Horton, Inc. (DHI) Did Hedge Funds Drop The Ball On Veeva Systems Inc (VEEV) ? Here’s What Hedge Funds Think About Annaly Capital Management, Inc. (... Did Hedge Funds Drop The Ball On Lennar Corporation (LEN) ? Here’s What Hedge Funds Think About Discovery, Inc. (DISCA) Were Hedge Funds Right About Flocking Into MSCI Inc (MSCI) ?